Once again, her fashion choices during the course of Inauguration Weekend, were perfection and beyond reproach, and furthered her status as a style icon. Each outfit was completely different, appropriate to each event, flattered her, played to her strengths, (of which there are many), and perfectly captured the essence of the designer whose creation it was. Through the variety, she always looks like 'her', and adds her own touch, which further individualizes and personalizes it. At the Kids Inaugural Concert on Saturday night, she relied on everyone's favorite 'uniform', a crisp white shirt and black pants, making it look especially festive and special by choosing an Alexander McQueen Victorian Bustle Cotton Piquet Shirt from resort 2011 ($990), and accessorizing with a $48 crystalized citrine belt from Anthropoligie (in case you haven't noticed, belts, especially statement making belts, have become somewhat of a Michelle Obama signature). At the Inaugural Reception on Sunday, she dipped into her closet, and opted for a black sequined Michael Kors sleeveless shift dress (that she has worn before, back in 2009), accessorized only with the perfect black suede pumps. Known for championing lesser known American designers, (we're always kept guessing as to who she will endorse), she selected a custom made Thom Browne coat and dress for Monday's daytime festivities. It was a brilliant choice and while it was somewhat subtle, in terms of color (navy and gray), the shape and cut was extraordinary. The necktie inspired ensemble, was a nod to menswear (yet achingly feminine thanks to the perfect shape). It also mixed two graphic patterns, (the coat was in a geometric foulard print and the dress was done in narrow horizontal stripes). While I did not really love the addition of the royal blue cardigan (she wore it beneath the coat and it was evident during the course of the luncheon), as I don't really think she needed it, and it added nothing to the overall look, the statement making belt (J.Crew), once again, added the perfect dramatic touch to the ensemble. As did the 'fierce' high heeled customized Reed Krakoff over the knee boots that she changed into after lunch, and were on view when she and the President took their walk down Pennsylvania Avenue. 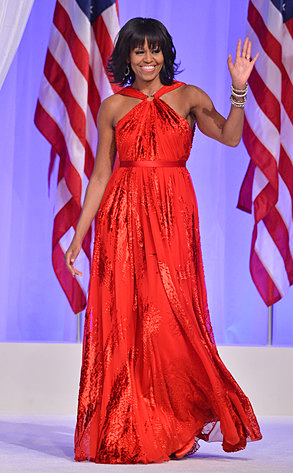 As for "The Gown",I had a premonition that she would wear shoulder bearing red on Monday Night. She stayed away from color during the course of the weekend, and what could be more flattering, celebratory, and all American, than red? Plus, it looks great against all those American Flags in the background. And I was actually not that surprised that she opted for Jason Wu. It's the ultimate form of flattery and endorsement, and while I loved the color but thought the style could have been a little more flattering, it's obviously the dress she felt the best and most comfortable in. Four years later, it's as though she (and he), had come full circle.